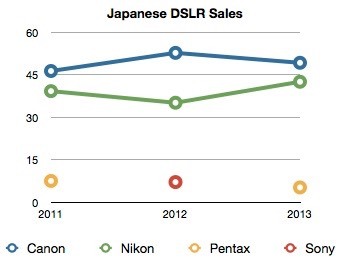 As you can tell, Canon and Nikon are essentially a duopoly in DSLR sales in Japan, with over 90% of the market. Sony and Pentax have been bouncing around with single digit market shares for some time there, now. The story is pretty much the same in the US retail market, though I believe that the differential between Canon and Nikon here is slimmer. These numbers are one of the reasons why everyone else darted to mirrorless (see related article on sansmirror). Remember, BCN's numbers are about what is actually bought at retail (in Japan), not what was shipped into the country or put on store shelves. BCN collects cash register receipts from about half the Japanese retail outlets and analyzes them for trends on a weekly, monthly, and yearly basis. The good news for Nikon is that it seems to be mostly holding its own against Canon in the DSLR race, not just in Japan, but pretty much worldwide. The relative positions ebb and flow a bit as new models and discounted models distort the overall picture, but it's essentially a duopoly in DSLRs. Neither Sony nor Pentax (now Ricoh) have managed to put a dent in the duopoly. When Sony took over the Konica/Minolta camera group, Sony executives were boasting that they would achieve a 20% market share in a couple of years. It's been more than a couple of years now, and the market share has actually gone down for the Alpha mount DSLR. Good thing no one remembers claims and projections in Japan. DSLRs are about 80% of the interchangeable lens camera sales worldwide at the moment, so the Canon/Nikon duopoly really extends into all interchangeable lens cameras, too. While Canon and Nikon have smallish shares in the mirrorless market, the largest share for anyone in the mirrorless market represents only about 9% of DSLR sales. Put another way, if you add together the mirrorless and DSLR sales, you get Sony in a distant third with less than 15% and no one else above single digit percentages. So it's still a duopoly, just a slightly weaker one. Some of the reason for the duopoly is simply price/performance. The perceived performance of the DSLRs is higher, while the prices of most mirrorless cameras are high. Until those things change significantly, we're likely to have the same scenario in interchangeable lens cameras: consumer DSLRs sell the best by a wide margin, while low end mirrorless sells in lower volume: not enough to dent the Canon/Nikon dominance.